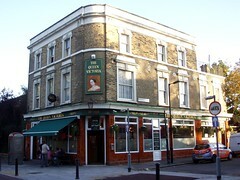 Locals' pub on Southwark Park Road in Bermondsey. bob visited on a Saturday afternoon in January 2009. The pub was full of regulars who were either watching the horse racing on the several large screens, playing pool, or having a good natter. The pool table was 50p per game. I had a quite good pint of Courage Best (£2.55) from the single handpump. Last visited by bob, 3 January 2009. Last edited 2011-06-26 14:34:23 (version 3; diff). List all versions. Page last edited 2011-06-26 14:34:23 (version 3).